The missionary work of the Roman Catholic and Anglican churches was, in the early years, closely tied to the care and education of “unwanted, orphaned and diseased [Aboriginal] children”. The periodic epidemics that swept down the Mackenzie valley during the late 1800s and early 1900s left Aboriginal families broken and children needing care. Some of the north’s earliest schools were established for this purpose. Missionaries recognized the limitations of the day school system and turned to a model that had been used for more than twenty years in the south, the residential mission school system. The first Northwest Territories mission school, opened in 1867 at Fort Providence (see map) by the Sisters of Charity (Grey Nuns), had eight resident students. In 1871 the Grey Nuns were caring for twenty-six children, twelve of whom were orphans. During its first twenty-five years of operation the Fort Providence mission cared for and educated 268 children from throughout the Mackenzie valley and from as far south as Fort McMurray. Both government and missionary sources suggest that the prevailing attitude was that Aboriginal people must remain reliant on hunting and trapping. Too much education could be harmful to a student’s reintegration into Aboriginal society. Early mission schools existed to care for the needy and through this work spread the Gospel according to the Roman Catholic or Anglican religions. While education of Aboriginal children was a federal government responsibility –often part of treaty obligations – attendance prior to the early 1920s wasn’t mandatory. The government had little to do with northern education – other than providing small per student grants to the churches – allowing the Roman Catholic and Anglican churches to exercise almost total control over the northern education system. 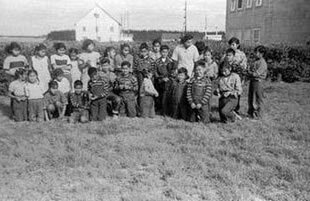 Between 1867 and 1920 Roman Catholic missionaries built residential schools at Fort Providence (Sacred Heart Residential School 1867-1960), Fort Resolution (St Joseph’s Residential School 1903-1957), Fort Smith (1915-1957), and Fort Simpson (1918-1958). Anglican missionaries established only one residential school during this early period St. Peter’s Mission and Boarding School in Hay River in 1894. This school closed in 1939.